In this area of the Apparel Search fashion brand directory, you will find men's fashion brands from leading apparel companies and fashion designers. On this particular page, you will find information regarding men's clothing with the Ecko brand. You are welcome to utilize this section of our clothing guide to review Ecko news, Ecko blog posts, Ecko photos, and more. Please understand that you may run into a few photos or a tad of information that does not actually pertain to the men's Ecko fashion brand. Unfortunately, no search technology is absolutely perfect. We will continue to do our best to bring you as much information about the men's Ecko fashion collection as possible. Yakira, L.L.C., doing business as Ecko Unlimited, is an American urban fashion company founded by Marc Ecko in 1993. The company makes apparel and accessories under brands including the men's Ecko Unltd. line. It is headquartered in South River, New Jersey. The company's products have been popular since the late 1990s. The brand had originally been associated with hip-hop and skating culture, and moved into the mainstream urban culture in the early 2000s. Its brand features a rhino as its logo. Learn more about the men's Ecko Unltd fashion brand. 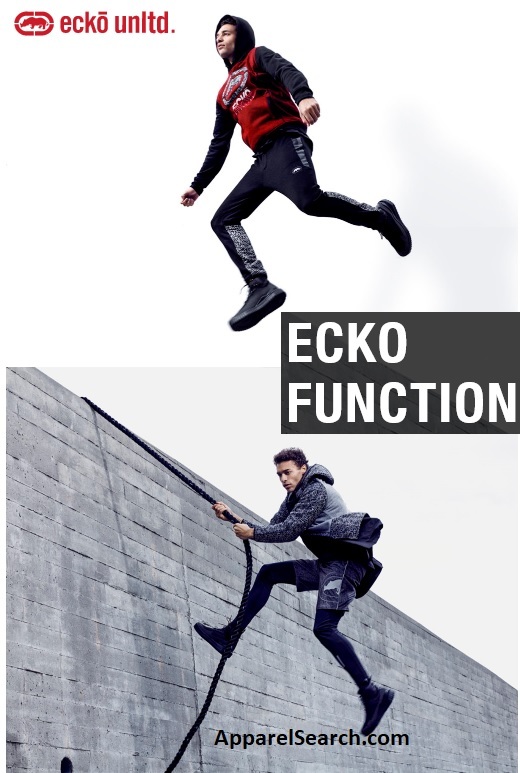 In December 2017, Ecko proudly presented, Ecko Function: a new collection comprised of statement pieces, blending athletic functionality with Ecko sensibilities. Many of the styles in the brands history has been based on graffiti art. If you have changed your mind and do not wish to research the brand Ecko, you can use the search engine on this page to find another clothing label that may be of more interest. Apparel Search is a leading guide to fashion, style, clothing, glam and all things relevant to apparel. We hope that you find this Ecko page to be helpful.